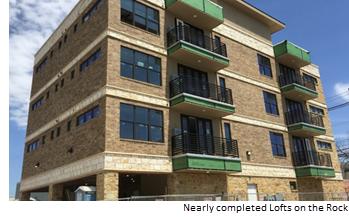 ​​​​ GEORGETOWN – Construction is expected to wrap up at the end of April 2018 on what is being billed as the first residential mixed-use project downtown. The Lofts on Rock is a five-story project at 810 Rock St. in the historic district. The building has 12 condominiums, plus commercial space on the ground floor. Units range in size from 645–800 sf and are priced from the mid-$200,000s to the upper $300,000s. “More and more people want the convenience and access of an urban lifestyle,” said Eric Visser, who founded Cerus Development.